Prevailing winds carry sands from dry lakes and other areas in the sinks and washes to form sand dunes up to 800 feet high. At first, dunes appear to be barren, but look closely. Evening primrose, blazing star, and other plants find sufficient moisture. 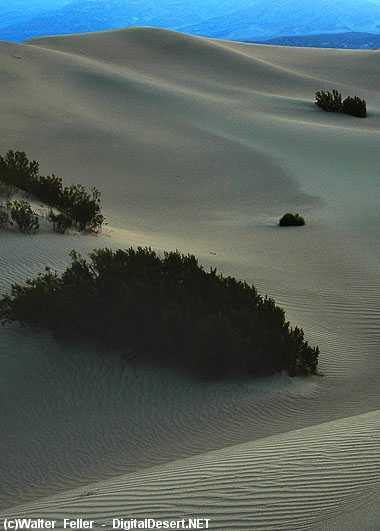 In favorable conditions dunes may be covered by Indian ricegrass. Perhaps you will see a Mojave fringe-toed lizard skitter across the dunes. Look also for tracks, especially of kangaroo rats and their main predators, kit foxes. Kit foxes are most often seen at dusk in open desert. They are about the size of a house cat, with agility to match. Fur-covered toes give them traction in sand. Also look for the tracks of the sidewinder, which glides along with a rapid, two-part motion, barely touching the sand.